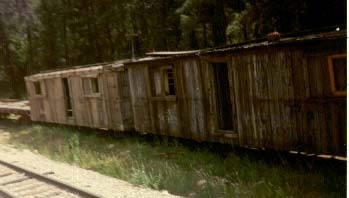 This swayback coach is at the Colorado Railroad Museum. I didn't record its heritage, but it has obviously seen better days. 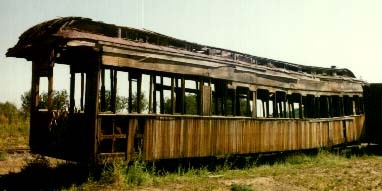 To me, it looks too far gone for restoration. 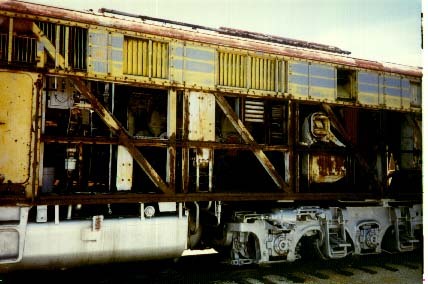 This is a scanned shot of a former Climax sitting near the engine shed at the Cass Scenic Railway in West Virginia. I don't know the heritage of this engine or if Cass intends to restore it. Along the Durango and Silverton there is are several sidings where tired old cars are stored, slowly rotting away. These appear to be a work car, probably dorms. This is the only shot that I got as I was fumbling to get more film in my camera. I would have truly loved to get some pictures of some really sad stock cars too. Railroad museums are a good place to find rotting junk. This formerly proud UP E9 has definitely seen better days. 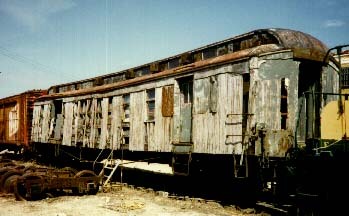 It is sitting on a storage track at the Illinois Railroad Museum. The rest of the engine wasn't in any better shape, but at least it was easy to seen the inner workings of a cab body type engine in a view not usually seen. 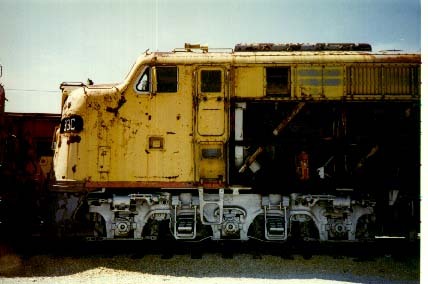 I have lost traceability for this photo, but I believe that this decrepit RPO is also at the Illinois Railroad Museum.